When looking for Toyota cars for sale in today’s fast-paced, technology-driven world, the internet is often the go-to method. Consumers can easily conduct a search for any make, model, year, color or style that fits their personalities and preferences. 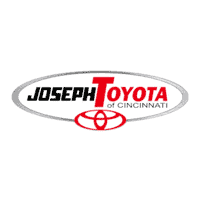 One visit to Joseph Toyota of Cincinnati, whether online or on our expansive lot, shows Toyota is a great brand to pursue. From its fuel efficiency and edgy sportiness to dependable reliability and attainable luxury, Toyota cars provide many options for what drivers are seeking in a vehicle. Toyota consistently wins J.D. Power awards for quality, dependability, and performance, year after year, and there are many solid reasons behind such success. A quick search for Toyota cars for sale, new and pre-owned — including models such as Camry, Corolla, Prius, Yaris, and Avalon — show the diversity in add-ons and features, technology, power, and safety ratings offered. Looking for fuel efficiency in a travel class? Maybe a roomy interior coupled with a superb ride, handling, and suspension design? Perhaps the most fuel-efficient all-wheel-drive hybrid in the U.S.? Our new and pre-owned Toyotas can provide the state-of-the-art advantages and affordable price points our customers seek. Toyota remains the No. 1 retail selling brand, and it’s no wonder the top-rated Corolla is a popular choice for fans of fuel-efficient compact cars. The Corolla boasts upwards of 30 city/40 highway MPG and up to 140 horsepower. With its peppy 1.8L standard engine and available 6-speed manual transmission, the Toyota Corolla has ideal power and performance potential. The Corolla offers up sporty interior seating for up to five and a light-creating moonroof option. 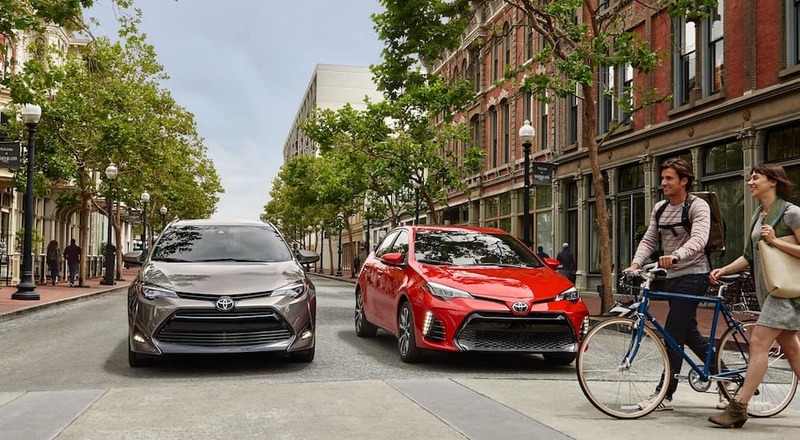 When browsing options for Toyota cars for sale, the Corolla is a perfect choice for best friends on a road trip or running the kids to soccer practice, as it comes in a hatchback option for optimal cargo space and performance. The new Toyota Corollas for sale at Joseph Toyota feature body styling upgrades that draw attention to its fluid design and fun personality. The new Corolla Hatchbacks have spruced up the grille, headlights, and taillights to tell more of a story. The Corolla Hatchback combines performance and fuel efficiency with a lighter, more refined 2.0-liter Dynamic Force Inline 4 engine, and Dynamic Shift-CVT transmission for a smooth ride. Top-rated Toyota Corolla safety features include an in-dash rearview camera, auto high beams, steering assist, blind spot monitoring, and a pre-collision system with pedestrian detection. Corolla’s advanced technology encompasses an available 7” or 8” touch-screen display, satellite radio and navigation, voice recognition, Bluetooth, Entune Audio Plus infotainment system, and Amazon’s Alexa or Siri Eyes Free voice-controlled functioning. The Toyota Prius is always improving, helping it reach optimal safety, fuel economy and emissions standards each new model year. The Prius is a ground-breaking symbol of innovation and technology prowess, ranking at the top of hybrids manufactured in the world. New updates include smaller, lighter hybrid components, including a lithium-ion hybrid battery to replace the previous nickel-metal hydride battery. The current Prius Two Eco model offers an EPA-estimated 58 city / 53 highway / 56 combined mpg fuel economy rating. Also, Prius’ 1.8-liter 4-cylinder gasoline internal combustion engine helps it achieve more than 40 percent thermal efficiency. Toyota describes the Prius interior as “a comfortable, high-tech space,” staying with the trend of offering car buyers advanced technology they can easily navigate. This includes a customizable, 11.6-inch HD touch-screen display that mimics the pinch, zoom, tap and swipe gestures of tablets and smartphones with a vertical orientation. For all grades, backup cameras come standard. The Prius feels ultra-modern with a sporty front seat design featuring form-hugging seats and wrap-around dash design, as well as increased front and rear headroom. Cargo space behind the 60/40 split fold-down rear seats tops out at a pleasantly roomy 27.4 cubic feet, and up to 65.5 cubic feet of total cargo space. To boost rear cargo space, the new smaller, low-profile battery now resides under the back seat instead of the luggage area. When asking whether to hybrid, or not to hybrid, Prius has the answer. Innovative, safety-rated Toyota cars for sale aren’t just limited to compact and hybrid models. The Toyota Avalon luxury sedan ranks high in both performance and style, for starters. Offing an exciting 301-hp, 3.5-liter V6 engine and new Adaptive Variable Suspension, the Avalon is fun to drive wherever you are going. The Avalon Hybrid even offers notable gas mileage with an EPA-estimated 39 highway mpg for those more concerned with getting there as inexpensively as possible. The Toyota Avalon continues to be recognized for its high-quality interior, aerodynamic performance, touring exterior, and luxury comfort, and we certainly understand why here at Joseph Toyota of Cincinnati. Standard safety technology includes traction control, a rearview monitor camera and rear parking distance sensors, and Toyota’s innovative pre-collision system with pedestrian detection. Joseph Toyota is happy to accommodate smart and savvy buyers seeking both new and used Toyota cars for sale. Our Toyota Certified Customers are eligible for new car financing rates, opening up a host of possibilities for purchasing today. We are proud to report we’ve sold more than two million certified used vehicles in the U.S. Many of the consumer perks of taking the certified used vehicle route at Joseph Toyota include 12-month/12,000-mile comprehensive and 7-year/100,000-mile limited powertrain warranties. We also offer a complimentary CARFAX vehicle history report and 160-point quality assurance inspection, along with one-year roadside assistance. Stop in or contact us via this website or friendly phone call to decide how certified used or new can work for a myriad of budgets. At Joseph Toyota of Cincinnati, we stand behind our dealership with fair prices and transparency. That extends from our new and pre-owned Toyota car inventories to our top-rated vehicle service department. Our customers can appreciate the knowledgeable advice that our Toyota Certified service technicians provide behind the scenes. Our team of dedicated auto sales and service professionals at Joseph Toyota has served the Cincinnati communities in Ohio since 1986, so we have a long and dependable history of making a difference for each and every customer. We make it our mission at Joseph Toyota to put our customers first. We can’t think of a better way to do that than with our First Responder Appreciation Program. This special pricing program is shared with first responders and immediate family members in gratitude of their selfless service and commitment to the community. We also help first-time buyers celebrate their special life goal milestones with auto financing for a smoother, easier car-buying experience. And we offer helpful tips on building up credit, improving credit scores, placing a minimum down payment, and more to help make our customers feel at home. We’re always happy to sit down and discuss special financing for customers who might be facing challenges such as a low credit score. Our new program helps people with less-than-perfect credit by working with lenders who can accept all applications, no matter the credit score. In short, we’re here for anyone and everyone looking for Toyota cars for sale. We look forward to extending a helping hand in the sometimes stressful world of car buying. Browse our site and come by and visit us in the greater Cincinnati area today!